Hands down, the best Facebook Extension for Chrome. Get notifications, post statuses, share links, checkin, like & comment and more! Today, everyone have a facebook account. It's hard to find someone who dont have an account on facebook. Many surveys have shown how much time people spends on facebook. Once you get an alert, say on mobile and you open your facebook account in your browser, just assume atleast half an hour gets wasted. So there is simple solution to this. A chrome extension "Facebook for Chrome" have made this thing far easy. Like when you are working and get an alert from facebook. You don't have to open the website itself. Just click the extension and whole of the website comes in front of you in the app frame. You can check from there and even reply to your friends, and as you click anywhere else that's it you are out of the facebook. Simple and best. 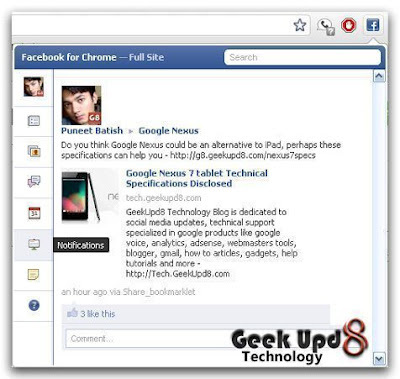 Facebook for Chrome is an unofficial extension that give you incredibly easy access to your Facebook news, notifications, and friends right from your browser toolbar. ✔ Instant Notifier: You'll know right away when someone posts on your wall, likes your status, etc. ✔ Posting & Sharing: No need to go to facebook.com just to update your status, post links, etc. Post directly from the extension. ✔ Right click to share! Right click on any link, picture, or page and click "Share on Facebook"
✔ Comment & Like: You can comment on statuses and posts right in the extension. So with all these features, you won't ever need to visit facebook website.